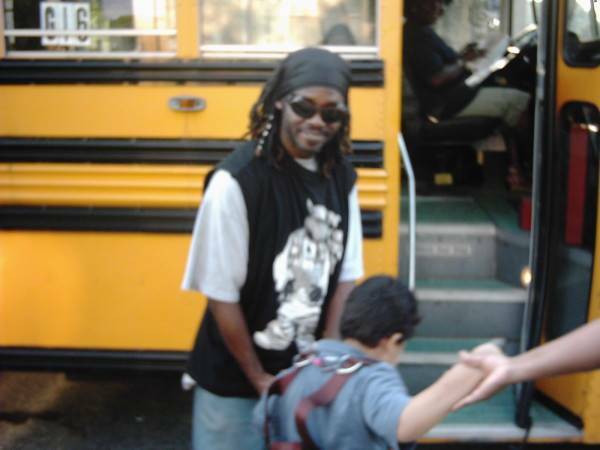 Bus attendant helps our son from his chair onto the school bus in PG County, spring of 2008 Photo @Kerima Cevik. guilty need parents have to try and get the best educational and therapeutic circumstances for their autistic children. I hope to completely eliminate that pattern of behavior in all of us by making it public so any parent who has been advised to do this in the past can stop doing this now. This pattern of behavior begins a ripple effect of harm that stays with our children and expands outward harming countless other autistic children along the way until something so drastic happens that things are forced to change too late to save the destroyed lives of all children in those expanding rings of abuse and cover-ups. What I mean is the act of repeatedly trading complicity by silence for some perceived advantage for your own disabled children. This major lapse in ethics to meet the needs of one at the expense of many especially angers me because my son was one of many other victims caught in the riptide of one of these ripple effect disasters. The actions of two autism parents had a big part in destroying my son's public school life and his trust in nearly anyone who resembles the staff who harmed him or stood by while he was being harmed. In the wake of the Weinstein scandal and the resurgence of the #MeToo hashtag created by Tarana Burke, a global conversation about sexual harassment has begun and I have been asking myself why autism parents aren't speaking out about the harm done to our children in schools and other settings meant to be safe spaces for them. Whenever I wonder whether I should have taken such offers at the expense of my silence or turning away while harm came to others like my son, I remember the guilt ridden mother of a nonspeaking Autistic daughter who called me because she made such a deal after her daughter was abused at school only to find out two years later while autism moms were gossiping during an event at the Arc of PG County that the next nonspeaking autistic child harmed by the abusers of her daughter was my son. Through bitter tears she talked about having to watch one of her child's abusers receive an award for their service to disabled children. She said she was braver now, she would never have let herself be bullied now, she needed my forgiveness for her silence. I told her to speak out now. To make things right now. So other children would not be hurt. She quickly answered she couldn't risk her children's placements in the prime schools paid for by her silence. She couldn't risk her good standing with the school administration and the community. Her husband had heart problems. On and on. A few days later, the mother of one of my son's classmates called to tell me that she lied to the IEP team during her meeting because they refused to give her son the inclusion time she wanted. She told them that I was building a class action suit against the school and if they didn't give her son the things she wanted she would join it. The team placated her, telling her they would give her son what she wanted. They then proceeded not to do so. She didn't call to apologize. She called furious that her lie was not effective and hoping to get something from me she could use to pressure them further. This explained the recent sharp increase in the belligerence of the school and why my son had been targeted. This was why he was continuing to come home with bruises and hungry because they were not feeding him the lunches we were buying for him. The woman's excuse was that her son was higher functioning than mine so inclusion would not benefit our child anyway. I felt bile rising in my throat and hung up. Two weeks later I heard she moved to another county where the schools were all inclusive model based. It is never too late for justice. Speak publicly about these people and what they have done. Stop using the suffering of your own children as a bargaining chip to some educational lottery win that depends on your silence. Your continued silence causes the needless suffering of countless other innocent disabled children. My son is one of them. Take the antidote to the slow poisoning of your souls your complicit silence creates. Speak up. Name names. Save everyone's children and show your autistic children they matter. Don't throw your children under the bus so you can feel better about something you got as a result.